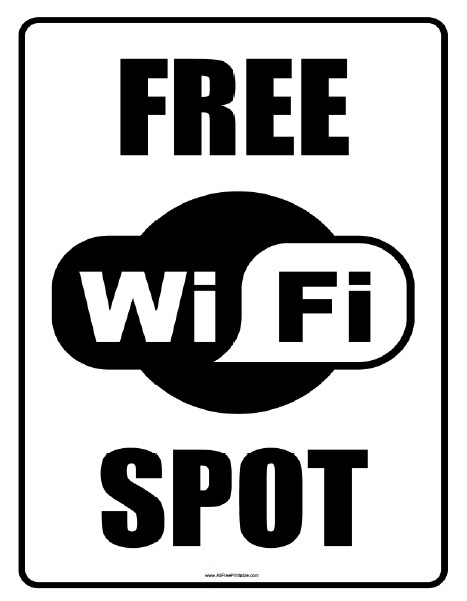 Free Printable Free WiFi Sign. Free Printable Free WiFi Spot Sign that you can use to announce to your guests that you have Free WiFi available. This is a great free temporary or permanent sign to get more people to visit your place, restaurant, store, coffee shop. When people know there is WiFi at your place they are going to visit more frequently and stay more time. Print this Free WiFi Sign free using your laser or inkjet printer, and put at a very visible place. You can save some time by just printing the Free WiFi sign using card stock paper with a photo frame and done. Click the link to download or print the Free WiFi Sign free in PDF format.